Is there a list of exactly which files are involved? No I got a reply from Britney about 3 hours ago. I got an email reply to a ticket I submitted a few days ago. I don't know about the phone support. Sometimes they go to meetings and nobody stays behind to answer phones (at least that is what they told me once when I finally got through on the phone later). I've left a couple voice mails in the past, but I never got a call back. When it was doing that for me...and even 4.5.1.6 would do that under certain releases of WINE it was more often then not, something to do with the animation of the loading box/progress bar...either the starting or stopping. Have DAZ servers download speeds been reduced? Uninstalled 4.5.1.6 first (and the Genesis start essentials 1.6), than installed 4.5.1.41. I didn't install CMS, I don't use it and I'm not planning to use it. Installed Genesis start essentials 1.9. I didn't have anything else loaded, just the one figure. 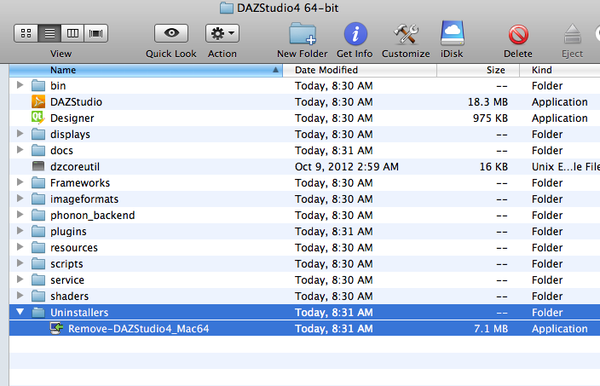 And it was the DS4.5.1.41 version as it was, no other content or directories in it. After a while I tried again, added the Kids4 Poser runtime. Loaded in Kids4, then dynamic bolero clothes, draping went fine. rendered alright. 2nd render with other lights - fine. 3d render wit other textures on kid and clothes - fine. 4the render with other lights - crashed. So it still can't do much more after 3 renders on my 32 bit computer. Works the same on genesis except you need genesis dynamic clothing. You can play around with mil 4 clothes to get them to work, but I had a difficult time of it. Well I just hit an odd bug in the Hex bridge. Sent genesis to Hex, no problem. Did a quick face morph and sent it back. When I applied the morph genesis's entire body morphed to an aiko like shape. There really should be a way to select the clothing and just switch out the skeleton of the V4 or M4 clothing with the Genesis skeleton. Would make all this so much easier. I'm afraid I'll have to buy a two terabytes external hdd in the near future to store all ds4 and genesis related updates. There is not nor has their ever been a "Start Menu" in OS X. 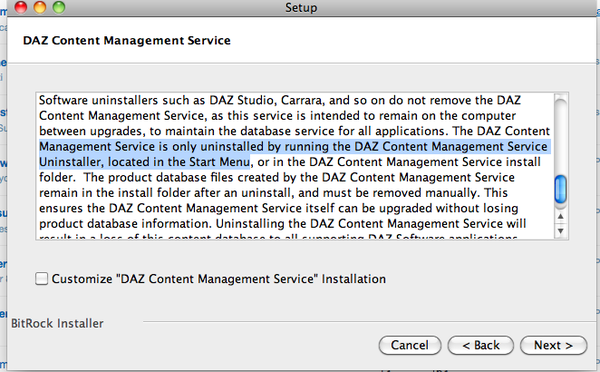 There is no Content Manager Folder in the Applications:Daz3D:DazStudio4-64bit folder and there is no content manager uninstaller in the DazStudio4-64bit:Uninstallers folder. I only found it using a different search utility - the built-in one doesn't look in the Library and System folders. Correct. The uninstaller is with the CMS application itself. thats all well and good but who QC'ed this installer and gave it the green light? Talk to Apple...they are the ones who decided what Finder 'sees' and doesn't see...and they are the ones who set the base permissions. makes no sense to house an installer in the library folder and thats not what they do for any of their other software packages for mac. It could easily be put in the Applications folder in the uninstaller folder which is implemented in for all their other mac titles. On top of that there is a secondary process to installing the CM that if you try and cancel it will remove the DS install along with it. How about erase the sentence with "Start Menu" since mac users don't have them and say you need to go to the library folder to remove it? the owness is on Daz to not be so sloppy with their mac stuff but it's one of many opportunities they could address for that platform and make that user base a little more confident about purchasing their wares. How long till next stable full release? I cannot afford rapid frequent re-installs of Studio but need some most stable, most recent bug free Studio for upcoming job. So, how long till next stable full release? There has never been a 'bug free studio'. Every version, public release or beta, has had bugs. I also cannot think of any way in which the word 'stable' can be applied to some releases and not others. I've never seen any qualitative difference between the public releases and the betas; they all have bugs. You just choose your bug set. This current beta has some of the bugs in the last public release fixed, but introduces some new bugs. That's the way it has been with every release, public or beta: some (but not all) bugs in the previous version fixed, plus some new bugs and maybe some new feature(s) with their own bugs. The good thing about the latest beta for me is that the content pane, in folder rather than tree view, is, in my normal layout, scrolling the folder window back to the left correctly when I click to go back up a level for the first time in any DS4 version, public or beta. About time. Anyway, for me the current beta is better and less bugged in (to me) important functions than the last public release. But people's useage varies, as does what are to them the most important features. And the prevalence of bugs appears to vary between people's different systems. There has never been a 'bug free studio'. Every version, public release or beta, has had bugs. I also cannot think of any way in which the .and that is true for many if not all software. There has never been a 'bug free studio'. Every version, public release or beta, has had bugs. I also cannot think of any way in which the . and that is true for many if not all software. And that doesn't account for patches for new found security holes. Basically if it isn't being updated constantly due to bugs or security holes, then it's not 'modern software'.,.. I don't think I have ever bought any software in the last 16 years that didn't have bugs in one shape or the other. True. Although the number of significant, obvious, workflow affecting bugs in basic functionalities without simple workarounds in DS is considerably greater than in any other software I use or have used. In other software I tend to find bugs in obscure functions or situations, and can readily work around them. In DS, in every version since the public 0.9 beta, I have tended to crash straight into major bugs during straightforward use that have completely stymied whatever I was trying to do. And when a version has finally arrived fixing that bug, I have leapt on it joyfully, onyl to crash into some new, work-stymiing bug. And the other big difference I have noticed is that for other software I have been involved with, where beta testers (their normal beta testers, not anybody with public betas) have said 'You simply can't release the next version with this bug unfixed, because ...', the software developer has listened. With DAZ they have generally ignored any such things from their beta testers and released anyway. Over the years of DS, after most releases I've seen users who have just upgraded and hit a major bug post something to the effect of 'How could the testers have missed this major, obvious bug and DAZ been unaware of it?' And the answer - unspoken - usually is that the testers didn't miss it and DAZ were aware of it and had been advised - even begged - by the testers not to release the new version in that condition, but chose to ignore that and the trouble it would cause the general customers. I have never seen anything like DAZ's woeful attitude to software release anywhere else. So i suppose it should have come as no surprise to me that they managed to create a debacle of a website 'upgrade' whole orders of magnitude worse than I've ever seen at any other website too. The fact that the website still isn't fully working right yet after all these months, and that even if it were, the 'upgrade' still represents a significant downgrade in useability for users (like still no easy way to see when a sale price ends, still no way to easily search past orders, still no automatic notification of upgrades to previously purchased content) is truly mind boggling.